Did you know that to earn money on YouTube you need at least 1,000 subscribers and 4,000 hours of viewing? Well, that’s where we’re going to start. Before showing you how to generate income on YouTube, I will explain how to quickly get your first subscribers. Would you like to know how to get 100 subscribers on YouTube quickly? Then do not go! What I’m going to tell you WORKS! The first 15-20 are easy, nothing to spread the word between your family and your colleagues. But between 15 and 100 … it can be done uphill. Do you want to get those first 100 subscribers quickly? How? The keywords of the long tail are the words that people look for but that do not have much competition. And we are going to take advantage of this to the full because it WORKS. What is the first big problem with YouTube? Well, making videos costs. And what happens to many people is that they find that those videos, in which they have invested so much time and work, nobody sees them. As a result, subscribers do not arrive either and, therefore, there is also no opportunity to earn money with YouTube. The strategy of Long Tail will help you to make your videos stop being in the limbo of YouTube. And the good thing is that this works regardless of the theme or sector. The long tail is good for everything! This strategy is easy and free. In fact, you only need to use your own YouTube search engine. Let’s say that your channel is dedicated to the “fortnite” sector. A very competitive issue that, a priority, it might seem that everything that can be said has already been talked about. Well, I’m going to show you no. If we do a generic search on Youtube, the search engine will show us with the “autocomplete” other related searches that people do, ordered from highest to lowest popularity. The issue here is that if you make a video called “Fortnite” you can forget, nobody will find it. You will find the most powerful channels in the sector. But neither would they find you if you made a video of “fortnite Android” or “fortnite dance”. The competition would still be too high. Solution? Bet on your videos by the combination of keywords that have to do with “fortnite”. The longer the keyword is, the more likely it is that it will have fewer searches, but it will also be much easier to position. And we are talking about that, to a greater or lesser extent, they are words that people are looking for, because Youtube itself is telling us. Positioning yourself for long tail searches will allow you to reach the people who still do not know you. And that is the beginning to get out of limbo and get your first 100 subscribers. Here we already have longer and more specific searches. And if they appear here, it’s because people are looking for this. If, for example, we search in YouTube “how to get legendary weapons in fortnite”, we can verify that even the best positioned videos do not have the long tail keyword directly in their title. What does this mean? That if you did it, surely you could position yourself quickly. The people who look for that will find you, they will know you and, if you give them what they want, they will subscribe to your YouTube Channel. But … We can still go further with the strategy of the long tail keyword How? Adding asterisk to the formula which would come to function as a kind of wildcard. We can put it wherever we want, at the beginning, at the end or in the middle, and with this we would be indicating to the autocomplete of YouTube that we look for more words associated with the search we are doing. This will give you a lot of possibilities to find long-tail keywords that have little competition and that will allow you to gain visibility more quickly. These are the first videos you should do on your YouTube channel because they are the ones that will help you reach people who do not yet know you exist and quickly win those first 100 subscribers to take off. From there, you can use other strategies that I will teach you to position yourself for stronger keywords. So you already know what you have to do: start looking for long tail keywords for your videos directly within YouTube and go making a list to go creating your first videos. What do you think about this strategy? Ask your questions and share your thoughts on the same in the below comment box. Check out our AllTop9 YouTube Channel. In this modern world, communicating through emails has become very common because it is the most direct way to reach users. And an email generates the highest Return of Investment (ROI) with excellent deliverability. That is why the marketers choose this medium for getting new customers and keep existing ones. There are various services for sending emails and tracking results on every email campaign. Now, we shall discuss the best Email Marketing Platforms to send bulk emails, bulk SMS, web push notifications and SMTP services with amazing features. 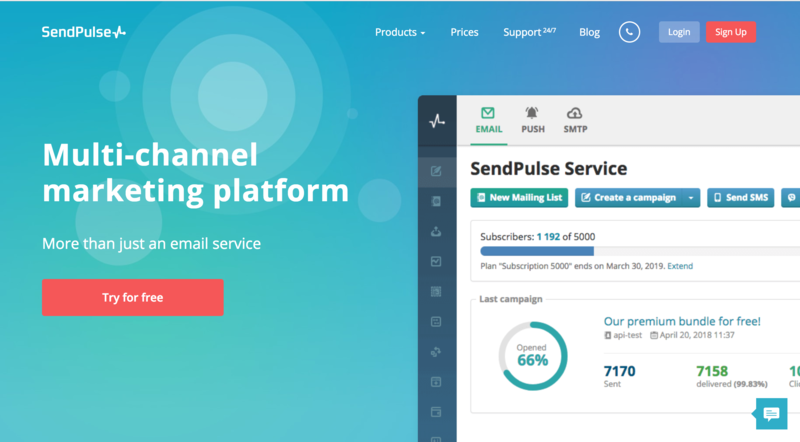 It’s SendPulse email marketing service. SendPulse is an integrated platform that allows its users to reach their audience not only through email messages but also through sending SMS and web push notifications individually. It also comes under a reasonable price, which is fast and instinctive to send emails that help users to grow their business and increase brand value. SendPulse was among the 3 finalists of The Next Web SCALE 2016 program. Why you have to choose SendPulse? SendPulse is a web-based service which has native iOS and Android apps. SendPulse has API and other integrations with third-party services like WordPress, Drupal, Joomla, Bitrix, WooCommerce, Shopify, Magento etc. SendPulse offers its users to create own subscription forms, email list segmentation, a series of emails, and API. Other than these, there are a lot of unique features that SendPulse provide. An email template can be created using many ways such as a regular HTML editor or upload a new template from a file, a URL, or by pasting the HTML code. Any template that you will create in this builder will be correctly displayed at any screen resolution. 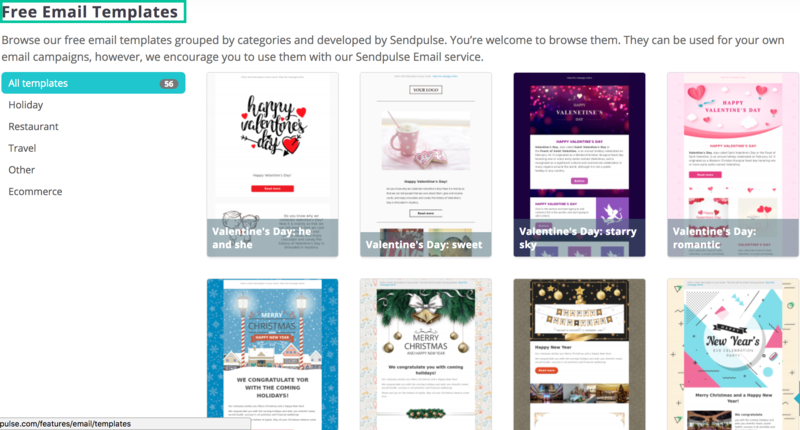 If you guys don’t want to waste time on designing unique templates, then you can take any template in SendPulse free email templates gallery. There are over 100 different categories to choose from according to the user’s interest. Creating one of its kind templates with SendPulse’s amazing feature drag-and-drop editor is so easy. Don’t worry, it doesn’t need any skills of a professional designer. It only takes 30 minutes to create an email (Person who is new to it). One of the main principles of editor is he/she can choose a set of blocks and drag the place to want. Elements like new section, text, button, separator, video block, and buttons of social links can be seen in the left side of editor. Automated email sending allows users to send a series of emails automatically. Basically, email campaigns are based on automated sending. When a new person joins your email list, the first email will be sent. Later after two days, the second email will be sent. And the last email will be sent the next weekend. On the other side, you can set up a series of emails based on the actions the person has made. If you have less than 2,500 subscribers, you can send up to 15,000 newsletters per month absolutely for free. Payment for a monthly subscription that lets you select the number of subscribers and emails you need. It starts at $9.85. Generally, merchants who sell goods and services online choose any one of these commission payments models. They are Cost per Sale, Cost of Lead and Cost per Click. Using SendPulse, a referral program is available in which a user can earn when he/she invite their friends to the service. SendPulse has a Startup Accelerator Program that provides a $5,000 grant for email marketing development to all the participants. The first thing a user must do when he/she decide to subscribe to your newsletter is filling in the subscription form. One of the main rules of the subscription form is to be handy for the users and have enough number of fields to collect information for you. SendPulse users can integrate mailings with services they already use. Integration is possible with CMS, CRM systems, and other services by using API. The method of A/B testing is used when the user doesn’t know what elements will bring better metrics of open rates and click rates. SendPulse’s A/B test allows them to find out how to improve the subject line and pre-header, the location of text, the calls of action, photos, number of links, etc. All the above elements prove that SendPulse is the best email platform for startups. The users can now use a single service provider and user list to do all your user communication, making user management, lists and data collection simple. Compared to all the competitors SendPulse provides the most capabilities on the free trial for an unlimited amount of time and has the largest number of subscribers that you can test the product on. SendPulse is the only provider offering live chat and phone support 24 hours a day, 7 days a week to all users. The Blockchain is, without doubt, one of the most popular words of recent times. The chain of blocks is a concept that raises a great revolution in the economy and in many other areas: a technology that can change everything. In this post, we talk about the uses of Blockchain in Digital Marketing. The blockchain is the technology (the information coding system) that is behind Bitcoin. However, its function goes further. It also serves to create other cryptocurrencies that are based on the same principles but have other properties to have changed the monetary policy or algorithm. The Blockchain is a technology that allows the transfer of digital data in a completely secure way thanks to a very sophisticated coding. It is usually compared to a book of accounts of a company where all the entries and exits of money are registered. Of course, in this case, we would talk about a book of digital events. The Blockchain contributes to a great novelty. And it is that this transfer does not need an intermediary to verify and approve the information, but it is distributed in several independent nodes that register and validate it. Thus, once the information is entered it can not be deleted, only new records can be added. In addition, it will not be legitimized unless most of them agree to do so. The latter is considered the impossible mission. In summary: it serves to streamline, reduce and secure processes. All transactions will be made with total transparency and intermediaries will be eliminated. Two parties, Ellie and Sheero, decide to exchange a unit of value (a digital currency, such as bitcoin, or another digital representation of some other asset, such as an educational/professional title) and begin a transaction. The transaction is sent with other pending transactions creating a “block”. The block is sent to the network of computers participating in the system. These computers (also called “miners” in the chain of Bitcoin blocks) value the transactions and, by means of mathematical calculations, they indicate if they are valid, based on agreed rules. When they reach a “consensus” the transactions will be considered verified. Each verified block of transactions is temporarily sealed with a cryptographic hash. In addition, all blocks contain references to previous block hashes, thus creating a chain of records. This chain will never be classified, it is considered impossible. The unit of value moves from Ellie’s account to Sheero’s account. 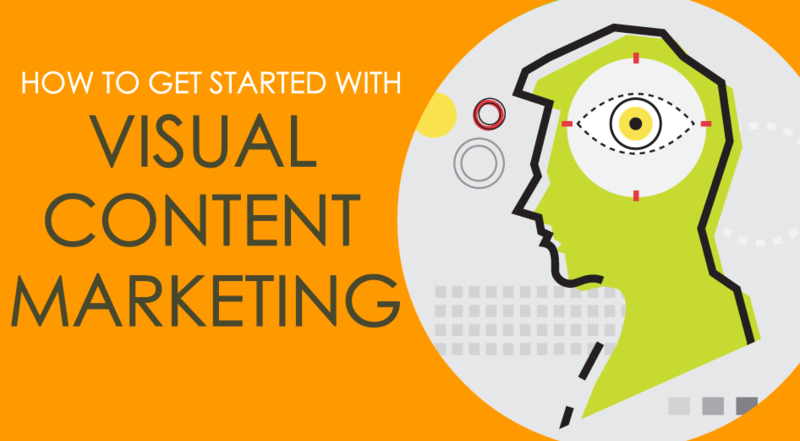 Now that we know what it is and how it works, it is time to discover what its uses are in Digital Marketing and take advantage of it in our strategy. The Blockchain provides full confidence when making transactions. Goodbye to fake ones. With the products within the blockchain could be tracked from its manufacture to its recipient. In this way, we could verify that what we buy is not a copy. This makes the brand stronger and eliminates the possible fear of the consumer to buy something counterfeit. This is already being done. As a sample, there is a company and its wine with Blockchain certification. Simply scan a QR code of the bottle you will have the exact information from the cultivation of the grapes, each transaction made by the suppliers and the final customer. Until now, if a company intended to do something we could not help but trust its word or resort to a professional (be it a lawyer, a notary, etc.) to be sure that it was fulfilled. This changes with the Blockchain and its smart contracts, that is, they are automatically fulfilled once the parties have agreed to the terms. These cannot be destroyed. A paper can be stolen, disappear, burned, etc. With Blockchain the “promise of the company” is responsible and public. Is this the end of the trolls? Think for a moment that to use the Internet we had to use a unique universal card or password. A key that would replace all the previous ones that we used to navigate, for the bank, social networks and other personal data. If all this information were in a Blockchain network would end the anonymity in social networks (happy trolls) and all those who pose as others to attack their competition. This would increase the user’s security. 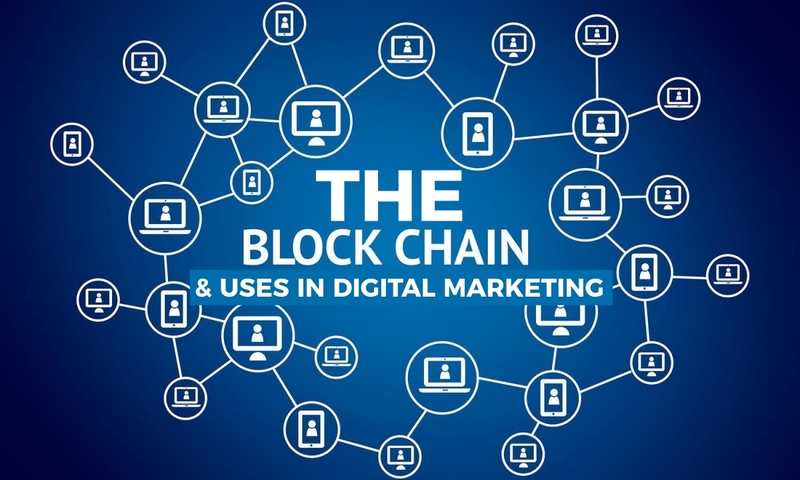 The current debate regarding Blockchain and digital marketing focuses on what to do if the user wants to charge for offering their data or for receiving an advertisement. And, of course, in the universe of the blockchain, each user owns their data. So, for example, if a brand wants to send a message to a user, it would have to ask. The consumer will price the transaction. And it would have to pay the user, but not the medium in which the ad is displayed. Following this, you would have a more faithful user (especially if you have decided to offer your data). This is all about the Blockchain and its uses in Digital Marketing. I hope this article helps you to learn about blockchain clearly. If you have any queries let me know in the below comment section and we will get back to you to solve all your queries as soon as possible. Would you like to add any other important points to this article? Then write them to us through contact us page and we will include them in this article once the verification is done.